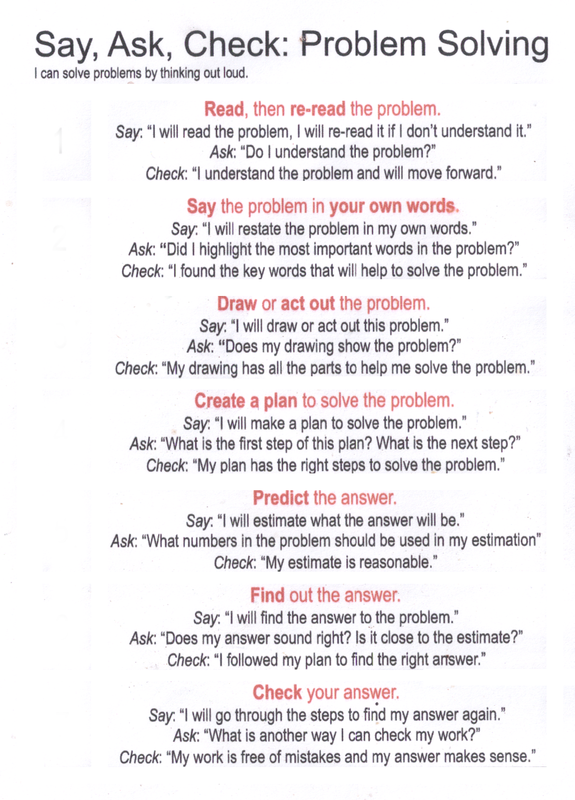 And it’s not as though passing these supertests indicates a great talent in the math that the common core espouses. Just jump through a different set of hoops. The Distributive Law, again ! It is a by-product of the law that it tells you how to expand an expression with a bracketed factor. In any case, what’s the big deal ? The theorem states that if we bisect an angle of a triangle then the two parts of the side cut by the bisector are in the same ratio as the two other sides of the triangle. So I thought, what if we move the point, G in the gif below, so that GB always bisects the angle AGC, then where does it go ? Or, more mathematically, what is its locus. Geometry failed me at this point so I did a coordinate geometry version of the ratios and found that the locus was a circle ( a little surprised !). The algebra is fairly simple. 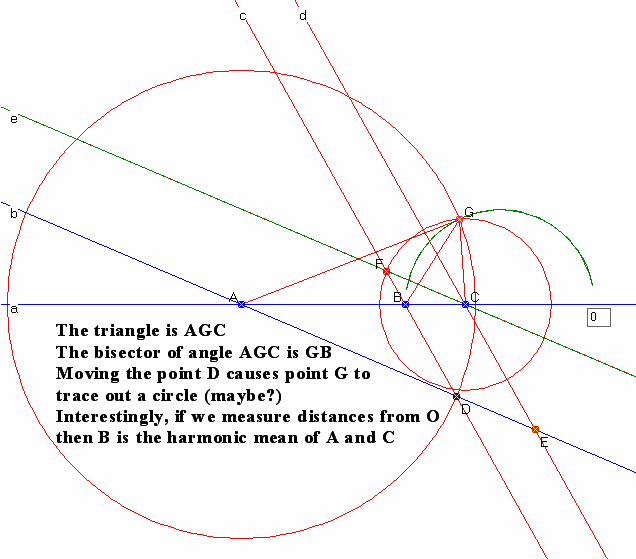 What was a real surprise was that if we take the origin of measurements to be the other point where the circle cross the line ABC, then point C is at the harmonic mean of points A and B. There is YOUR problem from this post. Getting the construction to show all this was tricky. It is shown below. I did the construction on my geometry program, Geostruct (see my Software page). The mean ? Which mean ? With interesting ratios. Playing around with the Harmonic Mean of two numbers I stumbled on an interesting ratio, and looked at the others as well. I am quite sure that there is a way of seeing these which ties them all together, perhaps Mr. Joseph Nebus can find it ! The harmonic mean can be used to explain the harmonic tuning of a keyboard instrument (as opposed to equal temper tuning). I am planning a post on this for later. The formula I gave for the harmonic mean is not the usual one – use a bit of algebra ! – but it is easier to calculate with. The RMS mean is used extensively in Statistics, Rigid Body Dynamics and Electrical Engineering. The well known 110 volts in your house electric system is the RMS mean of the alternating voltage actually supplied. 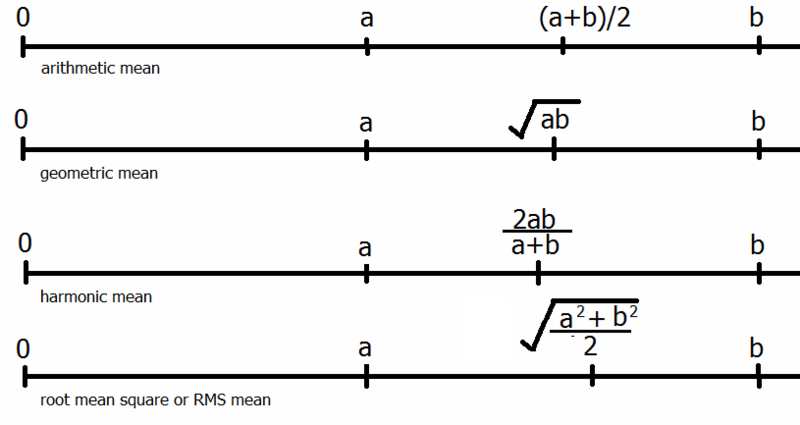 The Standard Deviation is the RMS average of the distances of the data values from the arithmetic mean value. A non formal view of these means (the first three) is that the arithmetic mean is about the positions of the two numbers, the geometric mean is about the absolute sizes of the numbers and the harmonic mean is about the relative sizes of the numbers. A “real life” geometry problem. While designing a system for connecting “educational” cubes together I figured that the holes in the faces had to be positioned very carefully. To achieve what I wanted the holes had to be positioned with length a equal to length b, and length c had to be twice the length a. 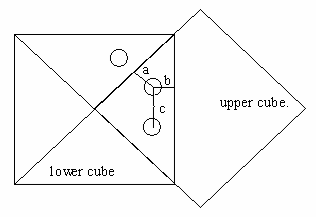 So what is length a, as a fraction of the side of the cube ? There will be eight holes altogether, and all cubes are the same size. so I posted it without further comment (too many <expletive deleted>’s required). I have come across this explanation in several places, and once again real damage is done to the language, and real confusion sown. “Distribute” means “to spread or share out” as in “The Arts Council distributed its funds unevenly, as usual. Opera got the lion’s share.” So it is NOT the a that is distributed. I tried to find a definition of the term in wordy form as it applies to algebra systems but failed. Heavy thinking produced the “answer”. What is being distributed is the second factor on the left. But so does 3 x 2 + 3 x 5. To check, get out the blocks ! So 3 x (2 + 5) = 3 x 2 + 3 x 5 ……… The Law ! 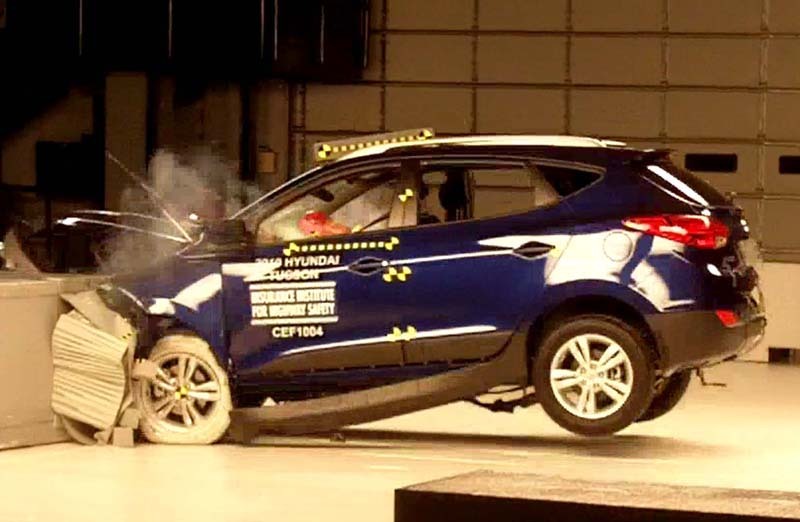 a wall, and the effect on the dummy people in the car is assessed. offered to women who had a higher chance anyway of having a syndrome baby. 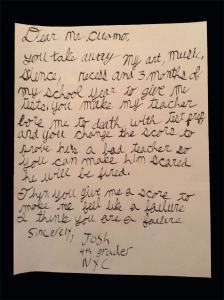 stakes testing in schools. Think about it. So what happened to “education”? Perhaps you all want to know what goes on in England. Here is a sample GCSE maths exam, taken at the end of year 10, or later, or still later. 3 exam papers in all. This is at the “higher”level and it shows what is expected by any student wanting to go on to higher education (University). Of course, more is required of those wanting to study maths, hard science or engineering. For the rest, maths stops here. 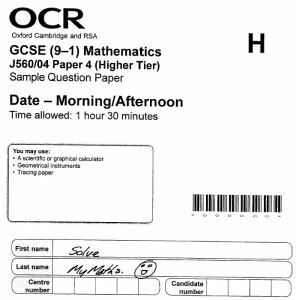 These papers are taken by the upper 30% of students. There is a foundation level as well, in which the top grade is deemed OK for college. Interestingly, Pearson has got its sticky fingers into the UK game as well. I decided I’d do the OCR Higher papers first. There are three, but I just did Paper 4 (which is paper 1… very confusing). This is a calculator paper, although I didn’t really need one for 95% of the questions. Time Taken : about an hour, during which I ate some sandwiches and listened to Radio 6 and took a phone call.